For the first game in the series, see Fester's Quest. For the series category, see The Addams Family. The Addams Family is a platform game released by Ocean in 1992. The game was released for Sega Genesis, Super NES, Amiga and Atari ST. It is based on the 1991 movie of the same name. The characters bear resemblance to their movie counterparts. 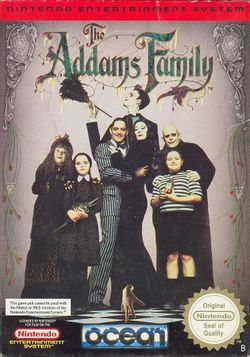 The game followed the Addams Family father and husband, Gomez Addams, as he attempts to save the members of his family who have been kidnapped. They have been stowed away in various locations in the mansion and are protected by a boss of some sort. The manservant Lurch and the severed hand Thing are the only characters not to be kidnapped. Thing will provide hints on gameplay whenever Gomez finds one of his red boxes marked with an 'A' for 'Addams'. Gomez starts outside the front door of the mansion. Inside the house, Gomez can move from level to level in basically any order. The player will soon discover that the mansion is full of secrets, hidden passageways and side levels and bosses (for the purpose of increasing Gomez's health). Gomez dispatches enemies by simply jumping on their heads (similar to the Super Mario games). He can also find objects to throw at them, such as golf balls. The game did not have a save system but, instead, bore a password system. Through progression of the game, the player would receive passwords, enabling him or her to start where they left off. This page was last edited on 25 March 2016, at 01:52.